Montpellier’s Grand Hotel du Midi has just had an overhaul, courtesy of designer Julie Gauthron, who enhanced the original staircases, stained glass windows and ornate ceilings of the 1876 Haussmannian building with unexpected colour associations from black and yellow to red and aubergine, and subtle touches - such as dancers engraved into desk legs - inspired by her grandmother’s tales of dance evenings at the hotel. Meanwhile, custom fabric headboards, zany wallpapers, bold carpets and 50s Danish-style furnishings result in a contemporary-baroque look. 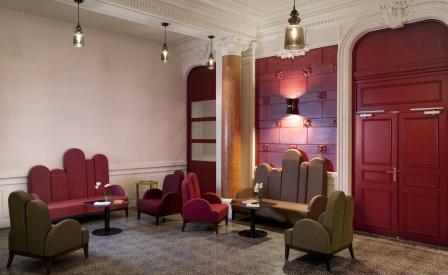 The same style runs through the scarlet red bar, Les Loges, where the eye bounces along the curve in the furniture. The breakfast room, with its original wood panels and green stained glass doors, are updated with dashes of lime and purple, while whimsical ballet motifs on the walls reinforce the hotel’s theatrical element. Outside, the hotel is lined with stone balconies, from where guests can watch life unravel in Montpellier’s buzzine square, the Place de la Comédie.